County Government: Kanabec County, Minnesota (County Assessor's Office); 19?? to 19?? He moved to Mora, Minnesota in 1977. Busse, Nick. "Putting His Theories to the Test." 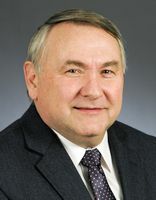 Session Weekly, St. Paul: Minnesota House of Representatives Information Office, January 14, 2011, p. 12.